By Salisbury University’s Conflict Analysis and Dispute Resolution Professor, Dr. S. I. Keethaponcalan. “This book introduces the subject of third party intervention, one of the core subject matters of the fields of conflict resolution and peace studies. It provides a comprehensive introduction to the dimensions, issues, and methods of third party intervention, and approaches the subject from an interdisciplinary perspective. It delves into third party definitions, typologies, actors, rationale, motives, decision dimensions, and roles. 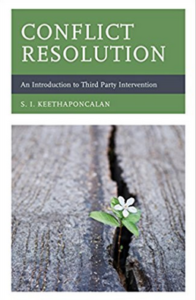 This book provides in-depth analysis of such third party methods as mediation, arbitration, hybrid procedures, problem solving workshops, and peacekeeping, uniquely bringing all major topics of third party intervention into one text. The last two chapters deal with timing of intervention and ripe moments, and ethics. Students of conflict resolution and peace studies will benefit from this book.”– from Amazon.